WILLIAMSPORT, Pa. – Adding to a growing list of accolades, senior Craig Needhammer (Lansdale, Pa./North Penn) became the third player in the Lycoming College football program’s history to earn Capital One Academic All-District honors twice in a career, as the physics major was named to the District 4 team by the College Sports Information Directors of America on Wednesday, Nov. 7. Needhammer joins a select group of Warriors that features Mike Kern (1984-85) and Keith Cadden (1995-96) as the only players in school history to earn the award in back-to-back years, as he is now eligible to earn Capital One Academic All-American honors, which will be announced on Tuesday, Dec. 3. 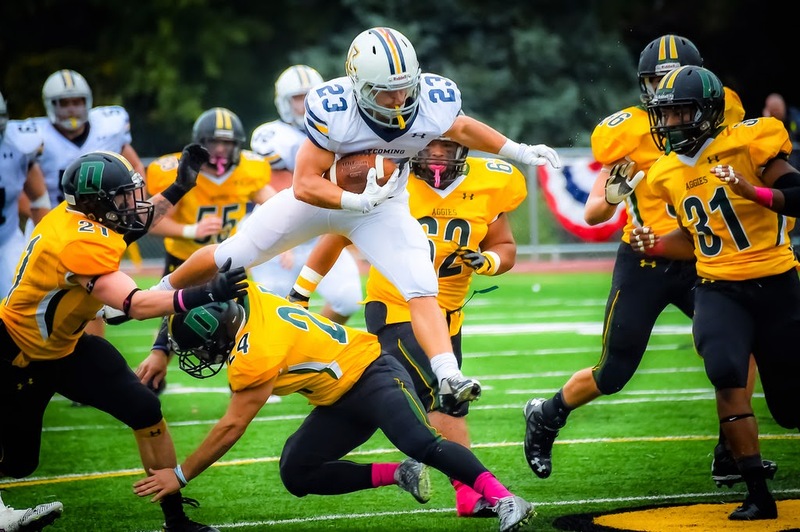 Needhammer holds the school's career rushing touchdowns (36), total touchdowns (39), points scored (234) and all-purpose yards (4,828) records, has his eyes on a few more standards his senior year is nearing a close. Needhammer's 15 100-yard rushing games is tied for the school record that was set by Brian Thompson (1995-98). He is also 285 rushing yards shy of Josh Kleinfelter's mark of 3,665 yards set from 2007-10. He had arguably the best game of his career against Misericordia in his last outing, as he became the first player in school history to post 300 all-purpose yards in a game, posting 239 on the ground (third-best in program history), three receiving and 62 on kick returns. He also became just the third player in school history to post 10 rushing touchdowns in back-to-back seasons during the game and he won his third MAC Offensive Player of the Week award for his efforts. A 2013 D3football.com All-East Region, Needhammer is also just 82 yards shy of becoming the three players in school history to post back-to-back 1,000-yard rushing seasons. A 2013 1st-Team All-MAC selection, he posted 1,184 yards and tied the school record with 14 touchdowns scored during the season. This year, he is third in the MAC in rushing (114.8) and first in all-purpose yards (176.3). He is also a two-time member of the MAC Academic Honor Roll.